Purpose Little is known about injury prevention practices in professional football clubs. The purpose of this study was therefore to determine the current perceptions and practices of premier league football clubs internationally concerning risk factors, testing and preventative exercises for non-contact injuries. Methods A survey was administered to 93 premier league football clubs internationally. The survey included four sections: (1) persons involved in the injury prevention programme: position, quantity, role, qualification; (2) perceptions regarding non-contact injury risk factors; (3) tests used to identify non-contact injury risk and (4) non-contact injury prevention exercises used, their perceived effectiveness and implementation strategies. Results 44 surveys were successfully returned (47%). The position of physiotherapist was the most represented position in the injury prevention programme. The top five perceived risk factors in rank order were previous injury, fatigue, muscle imbalance, fitness and movement efficiency. The five most commonly used tests to identify injury risk (in rank order) were functional movement screen, questionnaire, isokinetic dynamometry, physical tests and flexibility. The top five exercises used by clubs were (also in rank order) eccentric exercise, balance/proprioception, hamstring eccentric, core stability and, sharing the fifth position, Nordic hamstring and gluteus activation. Conclusions The survey revealed the most common perceptions and practices of premier league football clubs internationally regarding risk factors, testing and preventative exercises. The findings can enable reduction of the gap between research and practice. Despite the significant impact of injuries, little is known about the injury prevention practices employed by professional football teams. A literature search was conducted via the PubMed database (24 February 2014) using the following keywords ‘injury, prevention, soccer/football’ and identified only 26 articles focusing on professional male football players. Although science should help practitioners to identify risk factors and to choose the most appropriate preventative strategies, there is still a gap between science and practice.7 Overall, it does not appear that sports injuries are diminishing in elite European football.8 To the best of our knowledge, no large-scale survey on injury prevention has been published, and it is not known what practitioners do in terms of tests and prevention. There is a need, therefore, to determine the perceived injury risk factors, as well as the injury risk tests and preventative strategies employed for non-contact injuries in professional football teams. Therefore, the purpose of the present study was to determine, through an international survey, the current perceptions and practices of medical and science professionals working at the highest level of elite football regarding risk factors, risk testing and preventative strategies for non-contact injuries. Ninety-three clubs in total were invited to participate in this structured survey. The choice of clubs was determined by access to direct contact details. The invitation was sent to either the Head of the Medical or Head of the Science department by email, depending on the direct contact we had for the club. The email explained the purpose of the survey. Clubs were asked to complete and return the survey by email. An option to call to take responses over the phone was also offered. The telephone calls were undertaken by the first author. Only two clubs were interviewed by telephone (both English speaking). During the telephone calls, questions were asked as per the guidelines of a structured interview. This ensured that there was no bias between responses collected via email and those collected via telephone. When a questionnaire was only partially completed, follow-up contact was made with 14 clubs via email and no follow-up telephone calls were made. Eleven clubs responded to this follow-up action. If a question was still unanswered, it was excluded from the analysis. Data were collected between January and May 2013 and concerned the full season 2012/2013 or, in the case of Major League Soccer (MLS) and Australian A-league Season, 2012. A report of the global results was sent to all participating clubs. Forty-four of the 93 (47.3%) clubs invited to participate completed a survey, 3 clubs (3.2%) declined to participate, and 46 clubs did not reply (49.5%). Clubs were asked to tick either ‘agree’ or ‘disagree’ in response to the following statement: ‘The global results of the survey could be published in congress, courses and scientific articles. Individual responses filled will be anonymous’. All clubs which responded with a completed survey ticked ‘agree’. All clubs were informed of the purpose and objectives of the study. A full list of participating clubs and corresponding country and league is presented in table 1. The survey consisted of 17 questions (see online supplementary appendix A) and included four sections: (1) the persons involved in the injury prevention programme, (2) perceptions regarding non-contact injury risk factors, (3) tests used to identify non-contact injury risk and (4) non-contact injury prevention exercises utilised, their perceived effectiveness and implementation strategies. Two closed questions and 15 open questions were posed to the clubs. The questions were designed during a round-table discussion involving two sport scientists and one sports medicine doctor. The design of the questions took into consideration their combined knowledge and experience in professional football and their work in peer-reviewed research. The survey was pilot-tested with three professional teams before the official invitation to clubs to participate. Following the pilot survey, we deleted one question: asking clubs to specify their injury rates as it was deemed to be too sensitive. The absolute and relative values were calculated from information contained in the returned questionnaires. The normality distribution of the data was checked with the Shapiro-Wilk test. Differences were tested using student t test when parametric methods were used or the unpaired Mann-Whitney test when non-parametric methods were used and with a one-way analysis of variance. Where appropriate, post hoc comparisons were made with the Bonferroni test as data were normally distributed. The magnitude of differences between quantities of staff type was also expressed as standardised mean difference (effect size, ES). The criteria to interpret the magnitude of the ES were as follows: 0.0–0.1 trivial, very small, 0.1–0.3 small, 0.3–0.5 moderate, 0.5–0.7 large, 0.7–0.9 very large, >0.9 almost perfect and >1 perfect.9 To calculate the overall importance of each risk factor, a points system was used where a risk factor perceived to be ‘very important’ was awarded three points, ‘important’ corresponded to two points, ‘somewhat important’ was given a score of one point and ‘not important’ was awarded zero points. The total of these points were summed and then risk factors were ranked in order from the highest overall summed points to the lowest. A similar method was used to determine the ‘the five most important exercises’ in the injury prevention programme. Clubs were asked to rank in order of importance (1st to 5th) the exercises they considered as the most important in their injury prevention programme. Points were awarded as follows: exercises rated in first position were given five points, second position scored four points, third position scored three points, fourth position scored two points and fifth position scored one point. Points for each exercise were summed and ranked in order from highest score to lowest score. Significance was accepted at p<0.05. Forty-four questionnaires were included in the analysis; the respondents consisted of 27 sport science staff, 9 physiotherapists and 8 medical doctors. Table 2 details the quantity of staff type involved in the injury prevention programme. There were significantly more physiotherapists than doctors (p<0.0001, ES=1.16, perfect), and sport science staff (p<0.0001, ES=0.29, small). Also, there were significantly more sport science staff than doctors (p<0.0001, ES=0.53, large). Of the 25 doctors whose qualifications were specified, 2 (9.1%) held a PhD. Of a total of 93 physiotherapists, 1 (1.1%) possessed a PhD. Regarding the sport science staff, 8 (13.3%) of 60 successful responses possessed a PhD. Table 3 details the specific roles of staff in regard to the design, testing and application of the injury prevention programme. The five most important risk factors for non-contact injury rated by practitioners are presented in table 4. All clubs tested for injury risk during preseason, 36 (81.2%) in-season and 18 (40.9%) at the end of the season. The type of tests used by clubs is presented in figure 1. Biochemical markers refers to vitamin D, magnesium, copper, lactate, full blood profile, salivary immunoglobin A, testosterone and cortisol. Additionally, 22 (50%) clubs used other types of tests to detect injury risk. These included MRI and X-ray (2), running function (2) and verbal interview with players (2). Tests used by premier league clubs to detect non-contact injury risk (number on bar corresponds to n of teams; FMS). For all clubs, an injury prevention programme was stated to be of benefit and all prescribed an injury prevention programme to their players. Thirty-two (72.7%) clubs prescribed an individualised and global injury prevention programme to their players. The exercises used by clubs in the injury prevention programme are detailed in table 5. The five most effective exercises used in the injury prevention programme as rated by practitioners are presented in figure 2 (6 exercises in total; 2 of the exercises scored the same points). Top five exercises in the injury prevention programme of premier league clubs (maximum number of points possible—220). The frequency of the sessions for the injury prevention programme is presented in table 6. One match per week versus two matches per week. The frequency of the injury prevention programme is detailed in table 7. The number of sessions per week was significantly higher (p=0.0003, ES=0.95, almost perfect) when one match per week was played in comparison with two matches per week (2.4±1.2, range; 1–5 vs 1.6±1.3, range; range 0–5, respectively). The recovery time between an injury prevention session and a match ranged from 24 (7 clubs) to ∼96 h (1 club, figure 3). The recovery time between two injury prevention sessions ranged from 12–24 (1 club) to 96 h (2 clubs, figure 4). The recovery time between an injury prevention session and a lower-body strength session ranged from 12–24 (3 clubs) to 72 h (3 clubs, figure 5). The recovery time afforded between an injury prevention programme and a competitive match (number on column corresponds to n of teams). The recovery time afforded between an injury prevention programme and another injury prevention programme (number on column corresponds to n of teams). The recovery time afforded between an injury prevention programme and a lower body strength training session (number on column corresponds to n of teams). The perceptions and practices of professional football teams were studied with regard to non-contact injury risk factors, testing and preventative strategies. The aim of the study was to reduce the gap between what is actually conducted in practice and what is currently identified in the scientific research literature. The diversity of responses concerning risk factors highlights the multifactorial nature of non-contact injuries. Of the top five risk factors identified, four are modifiable: fatigue, muscle imbalance, fitness and movement efficiency while the remaining one, previous injury, is not. In line with the perceptions of medical and science staff in this survey, previous injury (1st) is also a well-supported risk factor for injury in professional footballers in the research literature.4 ,10 ,11 Fatigue (2nd) and fitness (4th) can be considered to be interrelated. Fatigue experienced during a soccer match has been suggested to increase the risk of injury.12–14 Additionally, playing two matches per week, where the recovery time is short, may cause players to be fatigued and is a possible explanation for increased injury rates during periods with congested match fixtures.15 There is conflicting evidence regarding muscle imbalance as a risk factor in professional football with some authors supporting a relationship16 ,17 while others do not.18 ,19 Regarding movement efficiency, it has been suggested that by adopting inefficient movement strategies, individuals may reinforce poor movement patterns that, despite achieving high performance, may eventually result in injury.20 However, there are no studies as yet supporting this as a risk factor in professional football players. Many tests are used by clubs to identify non-contact injury risk. The most common were FMS, questionnaire and isokinetic assessments. 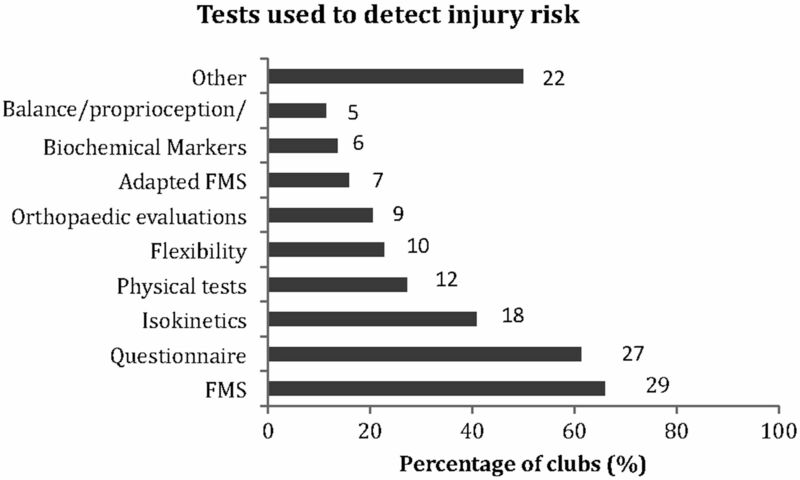 To the best of our knowledge, despite a lack of direct scientific evidence for the use of FMS as a tool to identify injury risk in professional footballers, 66% of clubs use this test. A further 16% of clubs also use their own adapted version. It is also interesting to note that while the premier league clubs identified fatigue and fitness as the top five risk factors, only 27% tested the physical capacities of their players as a tool to potentially identify injury risk. Similarly, although muscle imbalance was the third most important risk factor, only 41% of clubs used isokinetic tests in their testing protocol. It is therefore important to understand why some discrepancies exist regarding the use of tests, especially those with limited scientific evidence. Equally, there is a discrepancy in the non-utilisation of tests considering the clubs’ perceived risk factors. One conclusion is that the clubs have found some important relationships between practices that research has yet to validate. Additionally, the non-use of some tests may be due to factors such as the time required to perform and/or acceptance by coaches and players to allow the implementation of certain tests such as those including maximal effort or the cost to purchase-specific testing machines, making these difficult to introduce. The combination of ‘best practice’ and the available scientific evidence is crucial. The practices of experts in the field should also guide the activities conducted in research in order to confirm or refute such practices. 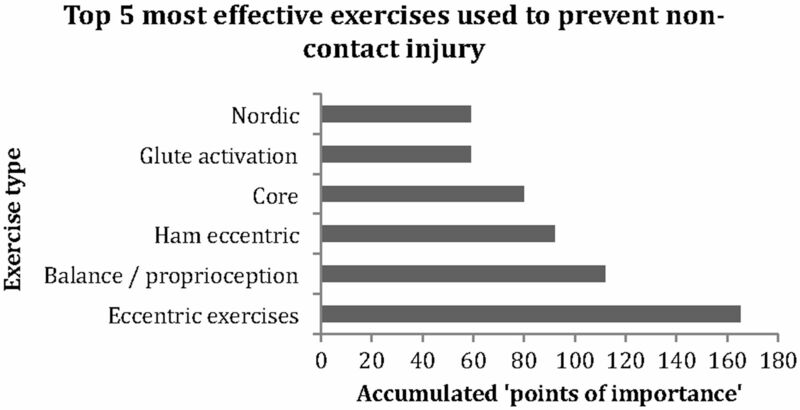 Eccentric exercise was rated as the most important exercise in the injury prevention programme of premier league clubs. Hamstring eccentric and Nordic exercise in particular were rated independently as the third and joint 5th most important exercises, respectively. It is suggested that eccentric resistance exercise may prevent injury by improving the muscles’ ability to absorb more energy before failing.21 Although there is evidence for the beneficial effect of hamstring eccentric exercise to prevent hamstring injury in professional footballers,22–24 there is little evidence linking eccentric exercise with a reduction in injury of other muscle groups such as the adductors, quadriceps, calf and ankle dorsiflexors and plantarflexors. Similarly, the evidence for balance/proprioception exercises (2nd most important exercise) to prevent ankle and knee injuries is surprisingly lacking for professional football players. Two studies have been conducted in semiprofessional footballers, with one reporting a beneficial effect on ankle injuries25 and the other on a knee ACL injury.26 Another study has demonstrated beneficial effect on ankle injury27 in ‘first division’ male players but the level, that is, professional or otherwise, was not specified. It is surprising that considering the importance of balance training as a preventative strategy, tests of balance were used by only 11% of clubs to predict non-contact injury, although the FMS test does assess some aspects of proprioceptive and balance ability. In a group of elite professional Australian Rules Footballers, core training (4th) has been shown to reduce the risk of severe injuries28 and result in fewer matches missed.29 To the best of our knowledge, however, no studies have been conducted in professional footballers. Interestingly, a systematic review comparing specific core exercises with traditional free-weight multijoint exercises30 showed that the free weight exercises such as the squat and deadlift are optimal to produce activity of the lumbar multifidus and with no difference in activation of the transverse abdominis between exercises. Concerning glute activation (5th), there are many studies investigating gluteus muscle activation in response to different exercises.31–33 However, none have checked the effects on reducing injuries. In the scientific literature, there are some guidelines regarding what exercises can be used to prevent injuries as well as some details on how these can be prescribed in professionals players (eg, sets, reps, frequency and progression), for example for the Nordic hamstring22 and yoyo hamstring curl24 exercises. There is, however, no clear consensus regarding the most effective approach to integrating a multidimensional injury prevention programme. Similarly, there are no clear guidelines regarding when the programme should be performed in relation to matches or other exercise sessions, for example, during congested schedules when two matches are played per week and recovery time is reduced. Additional research is thus needed to determine the optimal type, timing and prescription of exercises within a multidimensional injury prevention programme for use in the practical setting. There are some limitations to our survey. First, the clubs from different leagues were not equally represented, so we could not compare cultural differences. Second, there is a gap concerning the professional level of some clubs, in which resources (eg, equipment and staff numbers) will vary and will influence the practices of teams. Third, we did not obtain responses from some major leagues (eg, Germany, Portugal, Brazil and Japan). Finally, the response rate is only moderate (47%). This response rate could be explained by various reasons: (1) the clubs do not implement injury risk testing and/or prevention programmes and therefore felt uncomfortable about completing the survey, (2) they did not have time to fill in the survey, (3) they do not believe in linking science with practice by following an evidence-based approach incorporating knowledge and findings from the scientific research literature and (4) they deemed the nature of the information to be too sensitive to disclose. In conclusion, the most important risk factors for non-contact injury in premier league football clubs were previous injury, fatigue and muscle imbalance. The most commonly used tests were FMS, Questionnaire and isokinetics. Also, the most important exercises were eccentric exercise (in general), balance and specific hamstring eccentric. Premier league clubs appear to be following guidelines in research regarding certain perceptions and practices. These include previous injury and fatigue as risk factors, questionnaires to identify risk factors such as previous injury and implementation of hamstring eccentric exercise to prevent injury. However, clubs’ perceptions and practices are not always well supported by the research literature. It would be worthwhile to determine the level of evidence in the scientific literature for these beliefs and practices. A follow-up study by the present research group will systematically review the most important risk factors, the most commonly used tests and the most important injury prevention exercises. Preventative exercises and programme implementation strategies. We have reduced the gap between what is shown in science and what is actually carried out in practice. The authors would like to thank all the doctors, physiotherapists, fitness coaches and sports scientists who took the time to complete and return the survey. They would also like to extend their gratitude to the following individuals (in alphabetical order of surname) for their help in recruiting teams to participate: Dr Barry Drust, Tony Jouaux, Steve Kemp, Julien Lamblin, Gary Sherriff and Philip Yeates. Additionally, the authors would like to say a special thank you to: Dr Luis Serratosa for his continued support throughout the data collection period, Dr Rob Duffield and Dr Matthieu Ghenty for their useful insights regarding methods of analysis of the results and Professor Jiri Dvorak for his invaluable feedback in the article. FIFPro World Players Union. About FIFPro. 2013. http://www.fifpro.org/en/about-fifpro/about-fifpro (accessed 3 Mar 2014).
. Keeping your top players on the pitch: the key to football medicine at the professional level. Br J Sports Med 2013;47:723–4.
. Low injury rate correlates with team success in Qatari professional football. Br J Sports Med 2013;47:807–8.
. Injuries affect team performance negatively in professional football: an 11-year follow-up of the UEFA Champions League injury study. Br J Sports Med 2013;47:738–42.
. The Football Association Medical Research programme: an audit of injuries in professional football: an analysis of ankle sprains. Br J Sports Med 2002;37:233–8.
. An applied research model for the sport sciences. Sports Med 2008;38:253–63.
. A scale of magnitude for effect sizes. 2002. http://www.sportsci.org/resource/stats/effectmag.html (accessed 18 Dec 2013).
. Association between preseason functional tests and injuries in youth football: a prospective follow-up. Scand J Med Sci Sports 2011;21:e468–76.
. Effects of physical efforts on injury in elite soccer. Int J Sports Med 2010;31:180–5.
. Muscle injury rates in professional football increase with fixture congestion: an 11-year follow-up of the UEFA Champions League injury study. Br J Sports Med 2013;47:743–7.
. Intrinsic risk factors of noncontact quadriceps and hamstring strains in soccer: a prospective study of 100 professional players. Br J Sports Med 2011;45:709–14.
. Use of a functional movement screening tool to determine injury risk in female collegiate athletes. N Am J Sports Phys Ther 2010;5:47–54.
. Preventative effect of eccentric training on acute hamstring injuries in men's soccer: a cluster-randomized controlled trial. Am J Sports Med 2011;39:2296–303.
. Comparison of 3 preventative methods to reduce the recurrence of ankle inversion sprains in male soccer players. Am J Sports Med 2007;35:922–6.
. Can motor control training lower the risk of injury in professional football players? Med Sci Sports Exerc 2014;46:762–8.
. Effect of motor control training on muscle size and football games missed from injury. Med Sci Sports Exerc 2012;44:1141–9.
. Systematic review of core muscle activity during physical fitness exercises. J Strength Cond Res 2013;27: 1684–98.
. Gluteal muscle activation during the isometric phase of squatting exercises with and without swiss ball. Phys Ther Sport 2014;15:39–46.
. The influence of varying hip angle and pelvis position on muscle recruitment patterns of the hip abductor muscles during the clam exercise. J Orthop Sports Phys Ther 2013;43:325–31.
. EMG evaluation of hip adduction exercises for soccer players: implications for exercise selection in prevention and treatment of groin injuries. Br J Sports Med 2014;48:1108–14.
. Implementation of the FIFA 11+ football warm up program: how to approach and convince the football association to invest in prevention. Br J Sports Med 2013;47:803–6.
. Superior compliance with a neuromuscular training programme is associated with fewer ACL injuries and fewer acute knee injuries in female adolescent football players: a secondary analysis of an RCT. Br J Sports Med 2013;47:974–9. Contributors AM and GD planned the survey and created the initial injury survey. All authors contributed to finalising the final draft of the survey to send to clubs. FLG piloted the survey with himself and other doctors from two other teams. MN translated the survey into French and was responsible for the data collection and translation back to English of the French teams as well as being a follow-up contact for the French teams. AM and MD were responsible for contacting and recruiting teams from all other leagues, AM performed the data collection for all leagues except France. AM, CC and GD conducted the statistical analysis on the data. AM, CC and GD organised the layout and presentation of the results. AM, CC and GD completed the first draft of the injury survey. MN, MD, FLG and SB corrected and made suggestions on the first draft of the paper. AM and GD finalised the final draft to be submitted.